Are you searching for a quick gift, this buttoned mug cozy could be exactly what you are looking for, add a mug and a sachet of coffee or tea and it makes the perfect present. 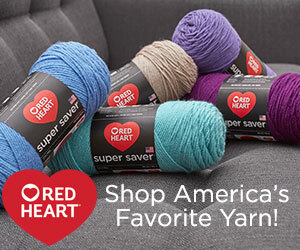 It is also a good pattern for you to use up your scraps of yarn. It’s an easy and quick design to make and will add lots of fun to keeping your drink hot for longer, make one or make a set for all your mugs, it’s up to you! ch11 loosely, work 1dc in 2nd ch from hook, 1dc in next ch to end. Turn. Work in back loop of stitch to 38th row. Pattern Row – ch1, 1dc in each dc to end. Turn. Work through both loops of stitch from now on. ch1, sl st in base of ch1, work a sl st in each dc to corner, sl st in each row end down first side of cozy, sl st in each along cast on edge, sl st in each row end up second side of cozy, sl st to first ch1. Turn. Border (Including Button Loop) – ch1, 1dc in base of ch1, 1dc in each sl st down first side of cozy to corner, 3dc in corner, 1dc in each next 4sl st, ch12, 1dc in each of next 4sl st, 3dc in corner, 1dc in each sl st up second side of cozy to corner, 3dc in corner, 1dc in each sl st to corner, 1dc in corner, sl st to first dc. Fasten off. Finishing – Weave in any loose ends and trim off, sew on button to opposite end of mug cozy and to correspond with button loop. Happy crocheting until next time. The written instruction and pictures for this pattern are copyrighted to crochet ‘n’ create © 2017. 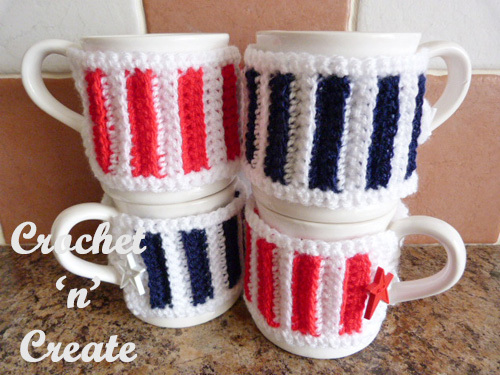 You are welcome to sell the finished products made from this free buttoned crochet mug cozy pattern, I just ask that you put a link back to crochet ‘n’ create. to the pattern page on crochet ‘n’ create. 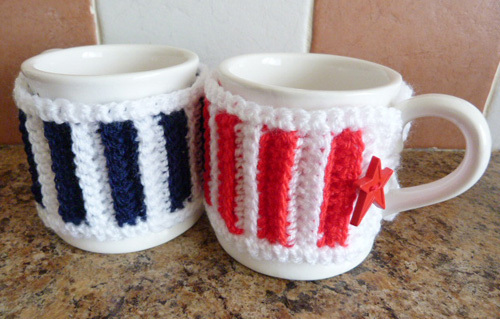 This entry was posted in free crochet patterns, Home and tagged crochet cozy, crochet for home, crochet mug cozy, free crochet patterns on 28th February 2017 by crochetncreate. You are all signed up Linda. Hope you enjoy all the crochet patterns.